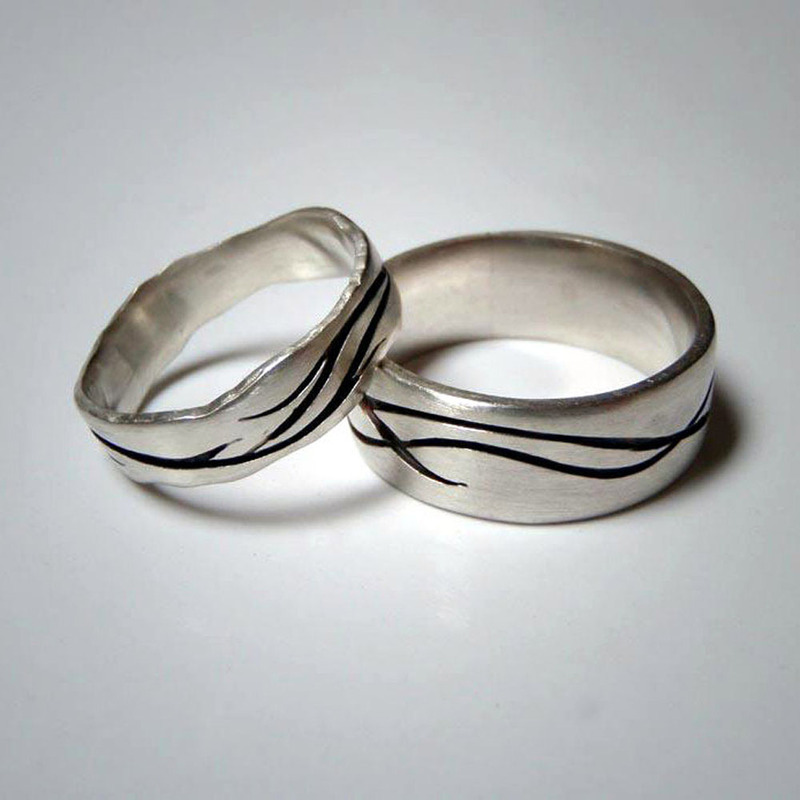 These wedding rings were made using a few damaged rings the couple inherited. The Diamonds and gold were given a new lease of life. Textured ring ring with recycled gold details. Made from an old unloved diamond earstud and half an unworn wedding band. Recycled gemstones from the customers old family rings. Smooth silver band with 5 tiny blue topaz gems for the bride & a textured silver band for the groom. 18ct gold details. Remodeled from an old wedding that had become too small for the customer. I stretched and textured the existing gold and soldered it to a more substantial silver base. The river pattern was handsawn and the gold grains soldered in separately. Deep blue sapphire cabochon with faceted rubies with 22ct Settings. Textured silver & gold stripe ring. Another spinner ring. Straight band with a wavy granulated top ring. Each silver and gold grain represented a year of marriage. 3 Ruby Ring. Set in 22ct Gold with 18ct Grains. 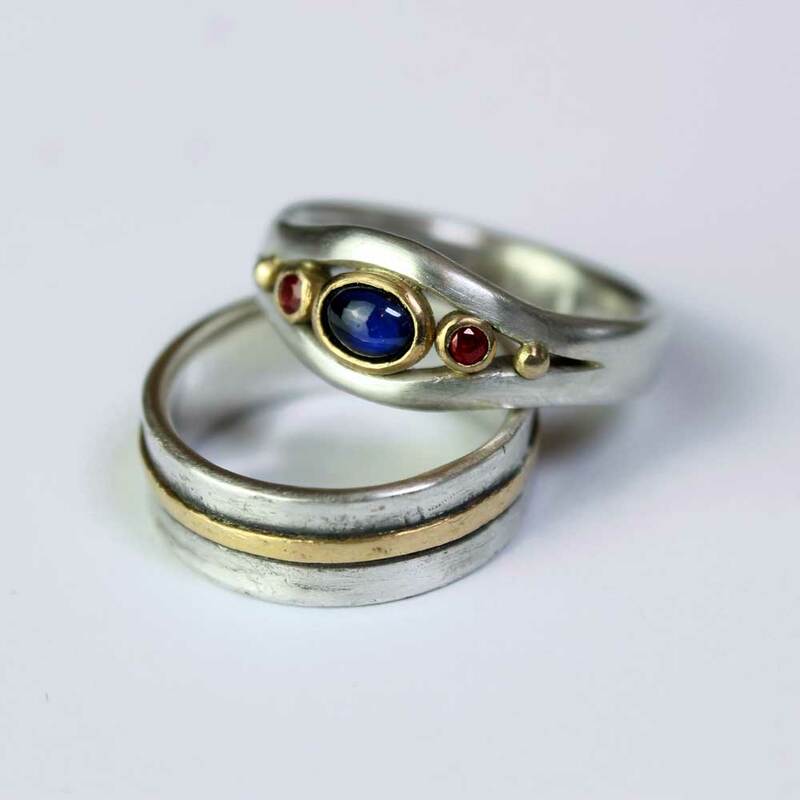 Wedding rings with indented oxidised lines and dots. Yellow gold grains in the bridal ring. Inspired by a design by CharChar Randell. Same Handsawn Design on Different Shaped Bands. The oxidised gold and silver outer rings spin around the wider inner textured bands. The same outline but different desings. Rough Textured Band + Recycled Rose Gold Grains.